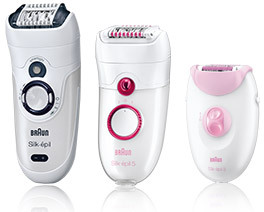 Choosing the best epilator can be a minefield. Like the manufacturers of most modern technology, the manufacturers of epilators try to blind you with science and reel off a long list of features that most people don’t know if they need or understand in the first place. Here at Epilator Info, we cut through all the jargon and tell you what the right epilator is for you. We have a buyer’s guide which will show you exactly what to look for and how to about buying an epilator, we have tips and all the latest in-depth hands-on reviews to help you make your choice as well as interesting and helpful articles. Lasts for at least 2 weeks. As epilators remove the hair from the root, it takes them much longer to grow back. This means you have at least 2 weeks of smooth skin and for some people up to a month. Epilators can be used on the whole body. Epilators can be used to remove hair from the whole body – legs, arms, back, underarms, bikini area and with the best epilators even the face.